- Why travel with us? Namibia, often called "the land God made in anger" by the ancient San tribes, is home to quaint coastal towns, tribal villages and the 80-million-year-old Namib Desert. International dialling code when calling Namibia: +264. International dialling code when dialling out from Namibia: 09. A direct international dialling service is available from the major hotels and lodges in Namibia. Electricity is generally supplied at 250 volts AC. English is the official language. Other Languages spoken include Ovambo, Damara, Kavango and Herero, German and Afrikaans are widely spoken. The Kavangos tribe make up 9%. The Herero, whose women dress in distinctive Victorian style, make up about 7%. The Himba, who are easily identified by their statuesque beauty, intricate hairstyles and ornamental copper necklaces and anklets, are a subgroup of the Herero. The Damara (or Nama) make up 5% of the population. They speak with interesting click sounds. The San (Bushmen) make up about 2% of the population and are the last representatives of the hunter gatherer tradition. There are also remaining German colonials. 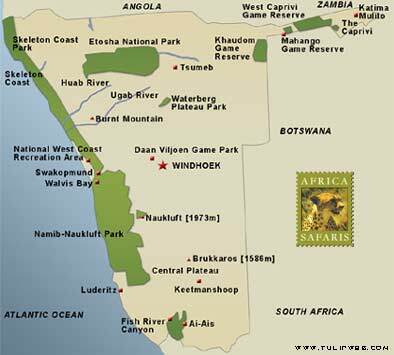 - the densely wooded bushveld of the Kavango and Caprivi regions. Spectacular shifting sand dunes spread inland from the coast, which has been described by many as the most desolate coastline in the world. The plateau runs from north to south and slopes away to the east into the sand basin of the Kalahari. A number of rivers run off the escarpment through dramatic canyons, including the Fish River Canyon, the world’s second largest canyon system. In summer, the days are generally hot and sunny. Daytime temperatures can rise to 35ºC (95ºF) and night temperatures drop to around 14ºC (58ºF) to 18ºC (65ºF). The coastal region is cool and dry throughout the year. The rainy season runs from February to March and average rainfall varies from less than 50mm along the coast to 350mm in the central region and 700mm in the far north-eastern region. In winter, the days are dry, sunny and mild to warm while evening temperatures drop sharply. Daytime temperatures generally reach 23ºC (73ºF) and can drop to as low as 0ºC (32ºF) to 10ºC (50ºF) at night. It can be quite cold and windy at the coast, for which warm clothing and a windbreaker are necessary. Best birding safaris are during the summer months because of the greater variety of species to be found. Best botanical months are December to May when the vegetation turns green, and also when most plants are in flower. Namibia is becoming very popular as an all year round destination.Traditionally, peak season is from July to October and middle season is from May to June. Book in advance during this time. Christmas and New Year is peak season for local holidaymakers. TULIP TRAVEL .LLC | 828 PROSPECT STREET, SUITE D | LA JOLLA | CALIFORNIA | 92037 | UNITED STATES OF AMERICA. ALL IMAGES AND INFORMATION CONTAINED WITHIN THIS SITE ARE PROTECTED BY INTERNATIONAL COPYRIGHT LAWS. PLEASE REFER TO OUR CREDITS SECTION FOR MORE DETAILS. PLEASE ALSO READ OUR DISCLAIMER & TERMS & CONDITIONS PRIOR TO USING ANY OF THE SERVICES CONTAINED WITHIN THIS SITE. THANK YOU.